Inspired by 20th century art-deco styling, the Waldorf range from Crosswater combines classic square lines with elegant soft edges to produce a luxury and striking look that is suitable for both contemporary and traditional settings. 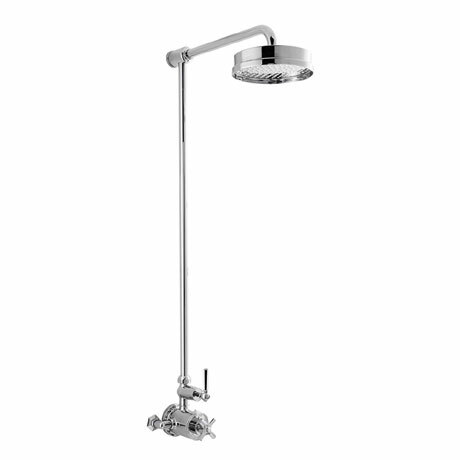 This chrome lever thermostatic shower valve with fixed head will certainly make an eye catching centrepiece with its timeless and elegant design. Available with an 8" fixed head as standard or add a touch of hotel luxury to bathrooms by upgrading to a 12” fixed head, the ultimate style statement for homes. Please note this item is made to order and can take up to 4-6 weeks for delivery, once ordered it cannot be cancelled or refunded.